Not much tourist know about this hidden piece of nature which brings you at least 50 years back to how Singapore was. This tour brings you back to our “Kampong Days” where Mother Nature plays a large part of daily life. Visit abandoned plantation, which still flourishes with tropical fruits for your plucking. ( If you can reach them…) Take a step back into nature and enjoy the beautiful stories about this beautiful island. Changi Road holds a remarkable amount of historical structures pertaining to the World War 2 period for Singapore. 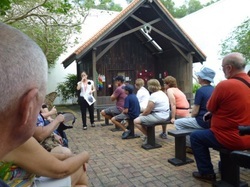 Our tour starts from The Changi Beach Park, which is home to one of the oldest housing estates in Singapore. 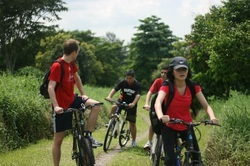 Ride through the corridor of the estates as we come to a road, which leads us to The Johore Battery. Learn about the significance of the battery, which guards the Northern seas of Singapore, and take pictures with a life size canon from the battery. Move further on as we pass by Selarang Barracks where the Selarang incident still holds painful memories by POW who served here during the WW2. We move on to The Changi Museum Chapel, which allows us to visit a replica of the original Changi chapel and head into the museum to read on the significance of Changi Road during the war. Finally, we journey back to Changi Village where we will stop for a local desert, Ice Kacang before visiting a local wet market and hawker center. The end of the tour brings us on a refreshing cruise through the coastal road of Changi Beach to the end point. 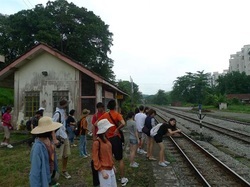 On the 30th of June, 2011, the last KTM railway trained pulled into Tanjong Pagar Railway Station. Along with it ended a beautiful heritage, which signifies the past union of Singapore and Malaysia. Follow the railway trail through the tunnels of history and enjoy the little bit of nature hidden within our concrete jungle. We have included this trail as part of our package to those who enjoy a bit nature along in our little home. Start off from Bukit Timah Road and follow the trails down to Holland Road!